SOUTH BEND, Ind. 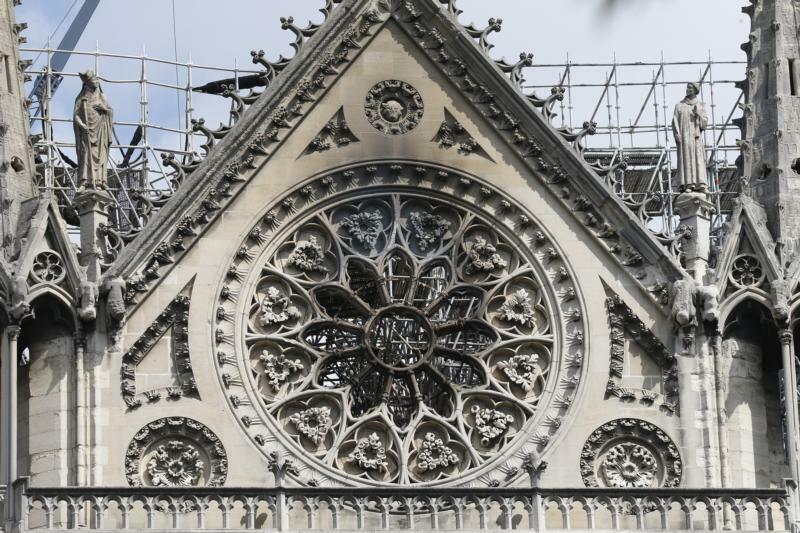 (CNS) — Holy Cross Father John I. Jenkins, president of the University of Notre Dame, has directed the university to donate $100,000 toward the renovation of the Notre Dame Cathedral in Paris. “We are deeply saddened to see the damage to … a church whose exquisite Gothic architecture has for centuries raised hearts and minds to God,” the priest said in an April 16 statement. The horrific fire that engulfed the centuries-old Gothic cathedral began about 6:30 p.m. local time April 15. “We join in prayer with the faithful of the cathedral and all of France as they begin the work of rebuilding,” Father Jenkins said. At 6 p.m. local time April 16, the bells of the Basilica of the Sacred Heart on the Notre Dame campus tolled 50 times — representing the 50 Hail Marys of Our Lady’s rosary — to mark the start of the rebuilding process for the cathedral. Other U.S. churches similarly tolled their bells, including St. Patrick’s Cathedral in New York City, the Basilica of the National Shrine of the Immaculate Conception in Washington, and Holy Name Cathedral in Chicago. In Washington April 16, President Donald Trump offered condolences to President Emmanuel Macron as France faces the enormous task of rebuilding Notre Dame Cathedral. The U.S. also has offered “assistance in the rehabilitation of this irreplaceable symbol of Western civilization,” according to a statement issued by White House press secretary Sarah Huckabee. “The United States stands with French citizens, the city of Paris, and the millions of visitors from around the world who have sought solace in that iconic structure,” she said. In the U.S., those who want to donate to the restoration effort can contribute through the French Heritage Society, a U.S. 501(c)3 charitable organization. FHS is the main American heritage organization in France and the U.S., and has given close to $2 million in restoration and education grants in the last two years. Donations made be made online at https://frenchheritagesociety.org/event/notre-dame-fire-restoration-fund. In Paris, authorities said the cause of the cathedral fire was not certain, but that it could be linked to renovation work that the cathedral was undergoing.